"What could be better? White chocolate, cheesecake and blueberry topping!" Preheat oven to 275 degrees F (135 degrees C). Make the crust: In a food processor, blend together the graham cracker crumbs, almonds and sugar until the almonds are ground fine. Pour in the melted butter and caramel while processing, until mixture is combined. Press the mixture onto the bottom, and half way up the side of a 10 inch springform pan. Make the filling: In a metal bowl over a pan of barely simmering water, melt the white chocolate, stirring until smooth. Remove from heat and set aside. In a large bowl, beat the cream cheese and 3/4 cup sugar until smooth. Beat in the eggs and the egg yolks, one at a time. Beat in the flour and the vanilla and blend in the melted white chocolate slowly, beating until the filling is well combined. Pour filling into crust. Bake in the middle of preheated oven for 1 hour. Then turn off the heat, and crack the oven door an inch, letting the cheesecake cool in the oven to room temperature. Cover loosely and refrigerate overnight before removing from pan. Make the topping: In a saucepan, combine 1/2 cup sugar and cornstarch. Stir in water and blueberries. Bring to a boil, then simmer for 10 minutes, stirring occasionally. Press through a fine sieve. Stir in lemon juice, allow to cool, and store in a glass jar. 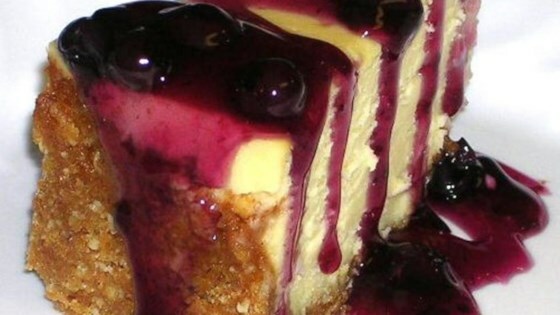 Blueberries and cheesecake go hand in hand beautifully for this delicious dessert. I made this cheesecake for our church's 4th of July baking contest and won a blue ribbon! It turned out perfectly with the additional 20 minutes in the oven. Very yummy!